MAGGIE VALLEY, N.C. – A group of 24 media gathered at Maggie Valley Club for the inaugural North Carolina versus Tennessee Media Golf Challenge. 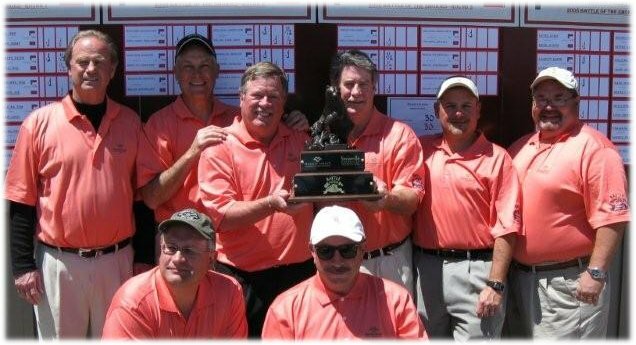 The event – dubbed The Battle of the Smokies – featured 12-person media teams from Tennessee and North Carolina competing in a Ryder Cup format, April 20-22. After three days and 36 matches, the squads finished deadlocked at 36 points apiece, forcing a sudden-death playoff. On the second playoff hole, Tennessee's Pat Kenney rolled in a 5-foot putt to edge North Carolina's Chris Cates. That putt gave Tennessee the title and the coveted two-foot trophy topped with a black bear sculpture, not to mention bragging rights for a year. The competition was so tight that neither side held more than a two-point lead throughout the three days. The score was knotted 30-30 entering the final 9-hole matches. Captains for the 2008 Battle of the Smokies were Stan Pamfilis of WLOS-TV in Asheville and Mark Packer of WVLT-TV in Knoxville. The media challenge will become an annual event, rotating between the two states. For further information on Maggie Valley Club, call (800) 438-3861 or log onto www.maggievalleyclub.com.